How To Make Bitcoin Paper Wallet? If you’ve learned about ways to store Bitcoin, you may be interested in owning a paper Bitcoin wallet. It is a highly secure way to store your stash, and it is relatively easy to make one. What is Bitcoin paper wallet? Bitcoin paper wallet is your public and private keys printed on a sheet of paper or other material. It is a simple instrument to receive, store and withdraw your Bitcoins. It has two QR codes on both sides, which makes it one of the most beginner-friendly wallets for the beginners. Paper wallets are generally counted as cold storage, meaning that your digital assets are stored offline. It is a significantly more secure method compared with keeping your Bitcoins in a hot wallet where anyone with the internet connection can access and steal them. Despite that, paper wallets also have their risks. Anyone who sees them can steal your funds, so they must be stored securely. Apart from that, you should also consider its fragility. Regular pieces of paper can decay, burn, or get wet and become unreadable, so you may want to put them in a fireproof, waterproof, or damage-proof storage, and print it with quality ink on a high-quality paper. Some people even go as far as to laminate their paper wallets to make them more damage-resistant. Using a paper wallet is rather straightforward. You can load funds to the wallet by using its public key or QR code. If you want to export those funds, you can import or sweep the private key to a software wallet and send them elsewhere. 1. 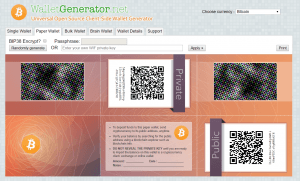 Go to one of the wallet generator sites. 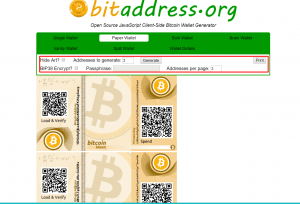 For this specific example, we’ll use the BitAddress paper wallet generator. 2. Once you enter the landing page, move your mouse cursor anywhere on the screen or type random letters in the given text box to generate the most random sequence of letters and numbers. 3. Once you reach 100%, you can specify what sort of wallet you want to make. The default option is “Single Wallet,” but you can also click “Paper Wallet” for a paper sheet with multiple wallets. 4. Your Bitcoin can be stored through the public address on the left side of the sheet. You can also select additional options such as hide cover art, add a passphrase and BIP38 encryption, and add more addresses. Once done, hit the print button, delete the digital wallet files, clear the browser cache, and your paper wallet is ready for use. Here you have it, your own Bitcoin paper wallet! After printing out your wallet, keep it somewhere safe! If anyone steals it from you, there is no way to retrieve it. It is also possible to accidentally expose your printed private key, so be careful. Someone has hijacked your computer or internet connection and could have seen everything that was going on your screen while you generated the wallet. If someone hacked BitAddress or other online paper wallet generator that you used, they might have a chance to collect all the private keys that people generated at the time. Your printer or computer may be set to save copies of all files you print. They might be stored in your computers or printers cache, so anyone who knows how to find them there (by using malware or by accessing your hardware) could sweep your paper wallets. However, there is no need to worry if you are at least somewhat proficient in securing your devices or if you aren’t going to store large amounts of Bitcoin in your paper wallet. Besides, you can always use a more trusted computer or a more secure internet connection. Alternatively, you can try previously mentioned Mycellium Entropy device to generate a highly secure paper wallet. And if printing a paper wallet doesn’t make you confident, you can always get a highly secure hardware wallet like Trezor or Ledger. As you can see, making a secure paper wallet is not difficult if you follow the guides to the letter and take proper precautions!